World in Motion: Hello, ladies, look at your man, now back to my...windows phone? Hello, ladies, look at your man, now back to my...windows phone? Good morning!! At last, Friday! Looking forward to some sunny days and golf this weekend. I'm driving down to North Carolina for the weekend in hopes to try escape this cold weather I'm not quite ready for yet. Anyways, remember those Old Spice commercials? 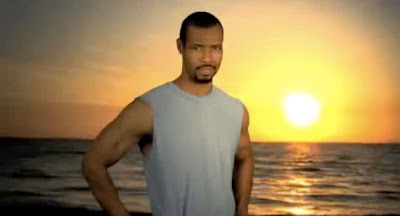 Well, Windows thought it would be clever to not only use Isaiah Mustafa, but also take the exact same routine he did for Old Spice (well pretty much). Isaiah Mustafa is helping launch Microsoft's Windows Phone 7 in Australia, by performing the all to familiar scene he did for Old Spice but introducing himself as "The most talked about man on the Internet." It actually reminds of the cupcake/orbit post APL posted a few days ago. I really hate it when companies can't be creative enough to come up with their own original campaigns. Lucky enough, most people already associate Isaiah Mustafa with Old Spice that when they do see him in this spot, the one brand that ends up sticking in your head isn't Windows, but Old Spice. Hope you guys have a great weekend! Leave your comments and I'll catch up with everyone next week! Originality should be the virtue. Old Spice it was. Well people might not worry about originality these days, but practicality.